"One of the ways Satan wants us to manipulate others is by dwelling upon and even exaggerating the evil in the world. "Certainly our world has always been, and will continue to be, imperfect. Far too many innocent people suffer because of circumstances of nature as well as from man’s inhumanity. The corruption and wickedness in our day are unique and alarming. "But in spite of all this, I wouldn’t trade living in this time with any other time in the history of the world. We are blessed beyond measure to live in a day of unparalleled prosperity, enlightenment, and advantage. Most of all, we are blessed to have the fulness of the gospel of Jesus Christ, which gives us a unique perspective on the world’s dangers and shows us how to either avoid these dangers or deal with them. 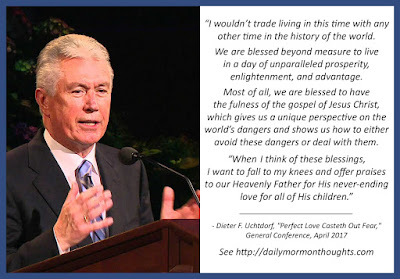 "When I think of these blessings, I want to fall to my knees and offer praises to our Heavenly Father for His never-ending love for all of His children. "I don’t believe God wants His children to be fearful or dwell on the evils of the world. 'For God hath not given us the spirit of fear; but of power, and of love, and of a sound mind' (2 Timothy 1:7). "He has given us an abundance of reasons to rejoice. We just need to find and to recognize them. The Lord often reminds us to 'be not afraid,' to 'be of good cheer,' and to 'fear not, little flock' (Luke 12:32)." It's interesting to consider the extremes of the position offered by Satan and by God. The first would create fear and dread, building on uncertainty and danger to cause us to struggle even more with the challenges we face. But the second offers a spirit "of power, and of love, and of a sound mind"—the knowledge that all is well in His hands, and we need only trust and follow. So our world is filled with "an abundance of reasons to rejoice"—and our task is "to find and recognize them." That's a great assignment! 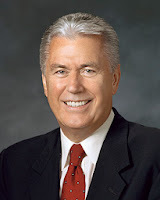 Labels: challenges, Gospel, gratitude, mortality, peace, rejoice, Uchtdorf Dieter F.